Hei, vierailen Delicious Doodles haasteblogissa tämän kuun, aiheena on "perinteinen joulu", kuva tai värit. Tein kolme korttia samasta joululyhty digileimasta. Hi, I'm honoured to Guest design at Delicious Doodles Challenges this month. The theme is "Traditional Christmas" ! 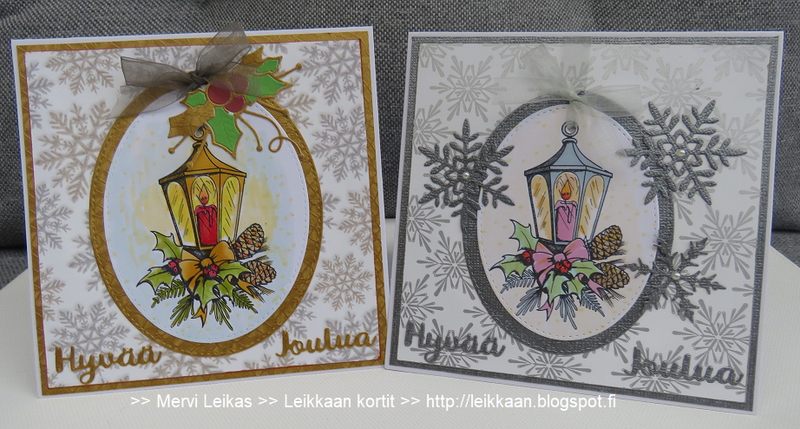 I made three cards with Christmas Lantern - image. Colouring with ProMarkers; white Sharpie pen. Ovals MFS, other diecuts Spellbinders; doily, lace, ribbon, twine, star charm and pearls. Papers are old Basic Grey's. 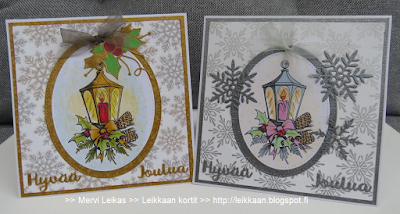 Three gorgeous cards, I love that beautiful image! Thanks so much for joining us at the Holly & Ivy Christmas Challenge! What a lovely lantern! Lovely creations!